Submitted by: Bright Funds Inc.
SAN FRANCISCO, Feb. 08 /CSRwire/ - Bright Funds, a leading workplace giving platform, announced today that it has completed the requirements for a System and Organization Control (SOC) 2 Type II Audit. With a focus on security, availability, processing integrity, confidentiality and privacy, SOC 2 best meets the demands of the Bright Funds marketplace. This achievement provides independent validation that Bright Funds’ internal controls are in accordance with the selected Institute of Certified Public Accountants' trust services principles and criteria. After reviewing compliance with the SOC criteria, the company conducted both an external and internal security penetration test. 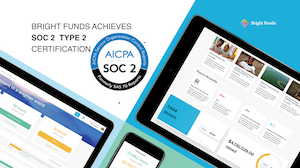 Leading independent auditor, Frank, Rimerman +Co completed the SOC 2 audit, verifying that Bright Funds processes and systems meet all the requirements for security, availability and confidentiality. Frank, Rimerman +Co is a California-based CPA and consulting firm and one of the top ten fastest-growing large accounting firms in the nation. “Achieving SOC 2 compliance is a major milestone for any service provider and demonstrates a significant commitment to a strong internal control environment. Obtaining a SOC 2 report is a major differentiator for Bright Funds as they look to continue growing their business," said Nelly Spieler, Senior Leader, IT Audit at Frank, Rimerman +Co. For more details, visit https://www.brightfunds.org/ or send an email to info@brightfunds.org. Bright Funds is a workplace philanthropy company headquartered in San Francisco, California. It partners with companies to provide them with a secure, global technology platform that supports employee giving, volunteerism and grants management.